Karen, our new HLAA chapter president, began the meeting just a little after 9:00 last Saturday morning. Our meeting was set up with CART and the hearing loop making for easy hearing access for everyone. 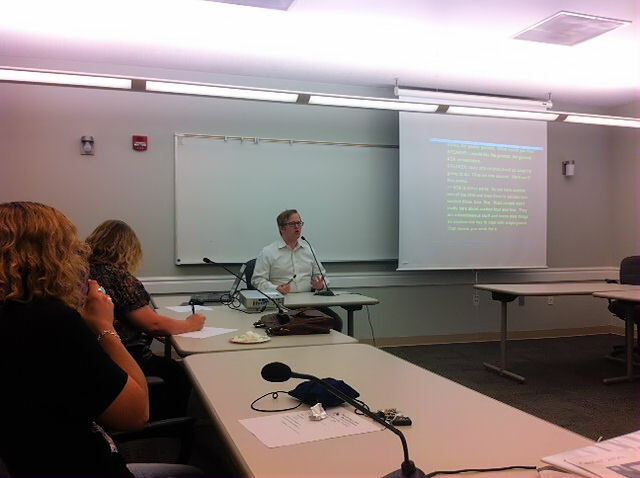 Our guest speaker was Jared Allebest who has a specialty in Americans with Disabilities Act (ADA). He gave a short presentation on the ADA featuring the different aspects. Title 1 applies to businesses with 14 or more employees. Title 2 which applies to places like city hall, court, prison and the police. Title 3 covers public places such as apartments (flashing door bells) and businesses we may go to (flashing fire alarms) and other businesses such as movie theaters with captioning access. He took questions from attendees ranging from park and recreation services (if they take money from the federal government they need to comply with the ADA), tenant laws, jury duty, renters rights and using captioned phones to document conversations. You can email questions to Mr. Allebest about ADA concerns at jared@allebest.com and he will answer within a week or so. If you need help writing a letter for reasonable accommodation, he can help with for a small fee. For more on the ADA, try this link: http://www.ada.gov/cguide.htm. It lists phone numbers, addresses and websites. During the meeting Karen also told us about the HLAA Convention last June in Austin, TX. She shared her experiences and the workshops she attended. Chelle later shared her experiences with the SayWhatClub Convention in Madison, WI last July. Thanks to all who attended! Our next meeting is Nov. 15th and the topic will be holiday depression.